امروزه رسانه‌ها تلاش می‌کنند تا در فضای رقابتی (رقابت رسانه‌ای) سهم مخاطب (سهم بازار) بیشتری را به خود جلب کنند. این امر ممکن نیست مگر اینکه در جامعه، نقش فعال و متمایزی را بر عهده گیرند. آنچه می‌تواند رسانه‌ها را در فضای رقابتی متمایز سازد، شهرت آنهاست. شهرت رسانه‌ها را چگونگی تعامل آنها با مخاطبان و همچنین فعالیت‌هایشان در زمینه‌های مختلف ازجمله محتوای تولیدات تعیین می‌کند. متغیرهای متعددی بر شهرت رسانه‌ای اثرگذارند و موجب می‌شوند تا در بازار اطلاعات، رسانه‌ای خاص در ذهن مخاطبان بنشیند. اما مهم‌ترین متغیر در این بین که منبع مزیت رقابتی نیز محسوب می‌شود، نیروی انسانی رسانه است. نتایج و ستاده‌های قابلیت‌ها، توانایی‌ها، مهارت‌ها و دانش نیروی انسانی در بازار اطلاعات انتشار می‌یابد و موجب می‌شود که رسانه به شهرت دست یابد. در مقاله حاضر، ابعاد شهرت رسانه‌ای به همراه و نقش توسعه منابع انسانی به عنوان مهم‌ترین عامل تأثیرگذار مورد بررسی قرار گرفته است. 1associate prof. in management, Tehran Uni. 2full prof. in management, Tehran Uni. 3assistant prof. in psychology, Allameh Tabatabaee Uni. 4assistant prof. in management, Tehran Uni. In today’s competitive environment, media try to attract more audience share from market. This is not possible unless media undertake a more active and distinctive role in the society. Reputation is a value distinguishing media in the increasing competitive atmosphere. Media reputation is determined by the way they interact with their audience as well as their activities in different fields, content in particular. Various variables affect media reputation and bring about audience’s preference of a certain media over others. However, the most important variable deemed as an important competitive advantage is media human resources. The results and implications of capabilities, capacities, skills and human resources’ knowledge is disseminated in information market and brings about the reputation of media. The present article examines all dimensions of media reputation along with the role of human resources development as the most influential factor. شریفی، مهدی. (1389). نقش توسعه منابع انسانی در دستیابی به چشم‌انداز 1404 صنعت نفت. 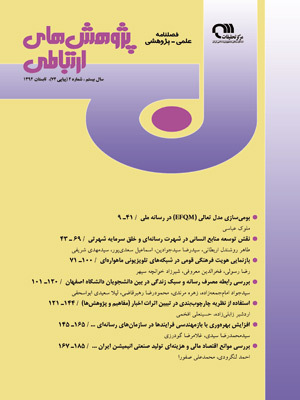 فصلنامه مدیریت منابع انسانی در صنعت نفت، 8 . کوواچ، بیل و روزنستیل، تام. (1385). عناصر روزنامه‌نگاری (ترجمه داوود حیدری). تهران: دفتر مطالعات و توسعه رسانه‌ها. لازار، ژودیت. (1380). افکار عمومی (ترجمه مرتضی کتبی). تهران: نی. منصوریان، حسین. (1388). طراحی مدل سنجش اعتبار خبر رسانه‌ای. پایان‌نامه دکتری. تهران: دانشکده مدیریت. نعمتی انارکی، داوود. (1388). مؤلفه‌های تحکیم اعتماد عمومی به برنامه‌های خبری صداوسیما. فصلنامه رادیو و تلویزیون، 5 (8). ویندال، سون و همکاران. (1376). کاربرد نظریه‌های ارتباطات (ترجمه علیرضا دهقان). تهران: دفتر مطالعات و توسعه رسانه‌ها. Barney, J. (1991). Firm Resources and Sustained Competitive Advantage. Journal of Management,Vol. 17, pp.99ـ 120. Barry, C.L. (1994). User-Defined Relevance Crriteria: An Exploratory Study. Journal of the American Society for Information Science, 45. Bowen, D.E. & Ostroff, C. (2004). Understanding HRM–Firm Performance Linkages: The Role of the Strength of the HRM System. Academy of Management Review, Vol. 29, pp. 203-211. Cappella, J.N. (2005). Why do People Watch News They do Not Trust :Need for Cognition as a Moderator in the Addociation Between News Media Skepticisn and Exposure. Media Psychology, Vol. 7, pp. 251-272. Chen, C.C. & Meindl, J.R. (1991). The Construction of Leadership Images in the Popular Press: The Case of Donald Burr and People Express. Administrative Science Quarterly, Vol. 36, pp. 521-551. Dowling, G.R. (2001). Creating Corporate Reputations: Identity, Image and Performance.New York: Oxford University Press. Ferris, G. (2007). Human Resources Reputation and Effectiveness. Fombrun, C. & Shanley, M. (1990). What’s in a Name? Reputation Building and Corporate Strategy. Academy of Management Journal, Vol. 33, pp. 233-258. Gamson, W.; Croteau, D.; Hoynes, W. & Sasson, T. ( 1992). Media Images and the Social Construction of Reality. Annual Review of Sociology, Vol. 18, pp. 373-39. Gans, H.J. (1979). Decidingwhat’snews. NewYork: Pantheon Garavant, T. (1997), Training, Development, Education, and Learning: Different or the Same, Training, Vol. 21, No. 2, pp. 39-50. Garavan, T.N. (2007). A Strategic Perspective on HRD. Advances in Developing Human Resources, Vol. 9, No. 1, pp. 11-30. Gilley, J.W. & Maycunich, A. (2000). Organizational Learning, Performance, and Change: An Introduction to Strategic Human Resource Development, Perseus Books, Cambridge, MA. Hatch, N.W. & Doyer, J.H. (2004). Human Capital and Learning as a Sourc of Sustainable Competitive Advantage. Strategic Management Journal, Vol. 25, pp. 1122-1178. Hetric, S. (2006). Corporate Reputations, Brandingand People Management: A Strategic Approach to HR. Jackson, K.T. (2004). BuildingReputation Capital: Strategies forIntegrity and Fair Play that Improve the Bottom Line. Oxford: Oxford University Press. Kothaa, S. Rajgopala, S. & Rindova, V. (2001). Reputation Building and Performance: An Empirical Analysis of the Top-50 Pure Internet Firms. European Management Journal, 19, pp. 571−586. Lasswell, H.D. (1949). The Structure and Function of Communication in Society. In W. Schramm (Ed. ), Mass communications, pp. 102-115. Lepak, D.P. & Snell, S.A. (1999). The Human Resource Architecture: Toward a Theory of Human Resource Capital Allocation and Development. Academy of Management Review, 24, pp. 31-49. Nadler, L. & Nadleer, Z. (1989). Developing Human Resorces, 3rded. Nafukho, F.M. (2006). Human Resource Development, Social Capital, Emotional Intelligence: any Link to Productivity?. Journal of European Industrial Training, Vol. 30, pp. 117-128. Rainbird, H. (1995). The Changing Role of the Training Function: A Test for Integration of Human Resources and Business Strategy. Human Resource Management Journal, Vol. 5, pp. 72-90. Rindova, V. (2001). Reputation Building and Performance: An Empirical Analysis of the Top-50 Pure Internet Firms. European Management Journal, Vol. 19, pp. 571-586. Roberts, J. (2004). The Modern Firm: Organizational Design for Performanceand Growth. Oxford: Oxford University Press. Self,C.C. (1996). Credibility in M.B. Salwen. Stacks (Eds), An Integrated Approach to Communication Theroy and Research. pp. 241- 444. Shanley, M. (1990). What’s in a Name? Reputation Building and Corporate Strategy. Academy of Management Journal, Vol. 33, pp. 233-258. Sharma, S. (1998). A Dynamic Theory of Corporate Reputation Formation and Stability. Working paper, St. Mary’s University, Halifax, Nova Scotia. Shoemaker, P.J. (1991). Mediating the Message: Theories of Influences on Mass Media Content. Swanson, R.A. & Holton, E.F. (2001). Foundations of Human Resource Development, Berrett-Koehler, San Francisco, CA. Zhu. Y. (2004). Responding to the Challenges of Globalization :Human Resource Development.